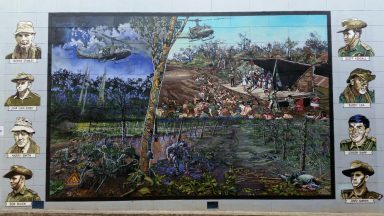 This mural commemorates the battle against the North Vietnamese Army and Viet Cong, by 108 soldiers of Delta Company, the 6th Battalion, Royal Australian Regiment, at Long Tan on the afternoon of the 18th August 1966. The crews of two helicopters from Nui Dat braved the poor conditions to drop ammunition to the beleaguered troops using helicopters that were originally transporting Little Pattie, Col Joye and the Joy Boys to entertain the troops. Warrant Officer Jack Kirby then distributed the ammunition. Eighteen of our soldiers were killed and 24 were wounded. This was Australia’s worst loss over a short period during the Vietnam War. Soldiers depicted are: Captain Stanley MBE (NZ artillery officer accompanying Delta Company); WO2 Kirby DCM (Company Sergeant Major); Major Smith SG MC (Officer Commanding Delta Company); Sergeant Buick MM (Took command of 11 Platoon upon the death of 2nd Lieutenant Sharp); 2nd Lieutenant Kendall MG (Commanded 10 Platoon); Corporal ‘Lea (Section Commander and local resident); 2nd Lieutenant Sharp (Commanded 11 Platoon until killed in action); 2nd Lieutenant Sabben MG (Commanded 12 Platoon). The artist’s commission was sponsored by Mayor Chris Loft’s Discretionary Funds. Patrick Phillips, the artist, was born profoundly deaf. 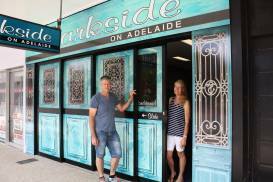 He grew up as a teenager in Maryborough. Patrick is experienced in the mediums of oils, acrylics, charcoal and pencil. Patrick has exhibited nationally. Being deaf he learnt to communicate through drawing and his art. He is a successful artist who has exhibited nationally. Patrick was assisted in the painting of this mural by Rodney McLeish who is also deaf.